The 3,477-kg spacecraft was released into a temporary orbit in space as planned at 2.45 a.m. [a.m.] IST on Thursday about 39 minutes after launch from the European space port of Kourou in French Guiana. It was dusk at the South American near-equatorial space port. 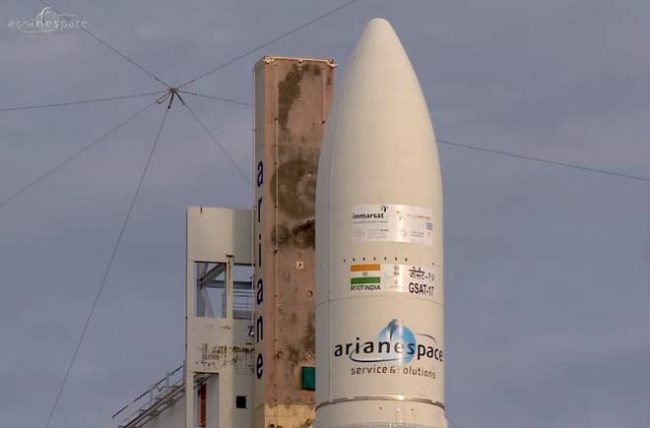 GSAT-17 was sent up as the second passenger on the European booster, Ariane-5 ECA VA-238, according to ISRO and the European launch company Arianespace. The satellite was released into what is called a temporary `geosynchronous transfer orbit’ or GTO, where it started orbiting distant 249 km at the near end to Earth and 35,920 km at the farthest point. Its operations were immediately taken over by the spacecraft command team at the ISRO Master Control Facility in Hassan. “Preliminary health checks of the satellite revealed its normal functioning. In the coming days, orbit raising manoeuvres will be performed to place GSAT-17 in the geostationary orbit (36,000 km above the equator) by using the satellite’s propulsion system in steps,” ISRO said. It normally takes around two weeks to reach and settle in its planned slot over India at 93.5° East longitude. Meanwhile its various functional appendages such as antennas and solar arrays are deployed. The spacecraft was approved in May 2015 with an outlay of ₹1,013 crore, including its launch fee and insurance. Its co-passenger was the 5,700-kg Hellas Sat 3-Inmarsat S EAN shared by two satellite operators. ISRO Chairman A.S. Kiran Kumar has earlier said they need double the number of communication spacecraft to support various users across the country. ISRO does not yet have a launcher that can lift payloads above 2,000 kg. As such it must hire foreign launch vehicles — mostly of Arianespace — to put its heavier communication spacecraft in orbit. Only this month, it tested its first GSLV-Mark III vehicle which can do this job for it. “Today, GSAT-17 became India’s third communication satellite to successfully reach orbit in the past two months,” said an official release. It launched GSAT-19 on the new MkIII on June 5 and the 2,230-kg GSAT-9 or the South Asia Satellite on May 5, both from Sriharikota. Designed and assembled at the ISRO Satellite Centre in Bengaluru, GSAT-17 has been at the Kourou space port since May 15, undergoing pre-launch checks and tests. Project Director Prakash Rao and a rotating team of over 20 ISRO engineers were attending to it during the period, said an ISRO official. Arianespace said this was its 21st Indian launch since the APPLE experimental satellite of 1981. ISRO’s upcoming 5,000-kg-plus advanced and heaviest satellite, GSAT-11, will also be launched by Arianespace. GSAT-17’s co-passenger has two operators. Hellas Sat 3 provides direct to home television and telecom services across Europe, West Asia and South Africa. Global satellite operator Inmarsat will provide in-flight Internet facilities for European airlines, as signified in the satellite’s tag EAN or European Aviation Network.